It’s really too soon to write about this book, but I can’t contain my excitement. 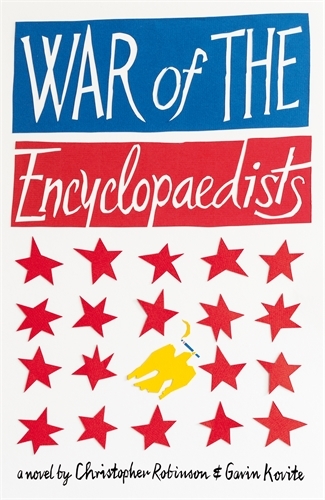 Christopher Robinson and Gavin Kovite’s War of the Encyclopaedists will be released on the 28th of May 2015 and this intriguing debut novel sounds brilliant, just read the synopsis. Set in 2004, two friends (Mickey Montauk and Halifax Corderoy) maintain their friendship through a Wikipedia article after Montauk’s National Guard unit is being sent to Baghdad and Corderoy has his own decision to make. I have never read a literary collaboration (although, in theory, all novels are a collaboration since agents and editors are involved in the process) still this is two authors narrating one novel and I’m curious how that works. The Hay Festival: 21 May- 31 May 2015. I was definitely going this year until my friend said she couldn’t come…so I would probably have to go alone and I am not that brave. Still who doesn’t want to see Kazuo Ishiguro (author of The Remains of the Day)? Early bird tickets to the Stephen Fry event have sold out. I’ve travelled everywhere, but I’ve never gone to a literary festival alone. We’ll see… you’re interested you can check it out here. Every February 4th I think about Jonathan Larson. It’s difficult to put into words what Rent did for me, but he changed my theatre experience. I had never witnessed so much inclusivity in the theatre and it was beautiful. He’ll never know how many people he influenced with his musical. Sometimes I think about how much more Larson could have done, I think about the musicals we’ll never see… I think about the Pulitzer Prize for Drama that he never got to accept. Jonathan Larson did something revolutionary and I only wish he could have seen the profound effect. I always reflect on his birthday with happiness because he was here. He left us a beautiful musical. Everyone keep an eye out for the latest issue of Five Dials. According to their most recent tweets, Five Dials 35 is coming soon and it features the making of Richard McGuire’s Here. Lovely readers, I am going to be querying again so wish me luck. La Vie Bohème!